ORCHARD PARK, N.Y. -- New York Jets star defensive end Muhammad Wilkerson suffered a lower right leg fracture Sunday. It will likely require surgery, which raises questions about Wilkerson's future as he heads into free agency. Jets coach Todd Bowles confirmed the injury after the Jets' 22-17 loss to the Buffalo Bills. The defeat, coupled with thePittsburgh Steelers' win, eliminated the Jets from the playoffs. Wilkerson didn't speak to reporters, but he was seen leaving the locker room on crutches and wearing a walking boot. Wilkerson was hurt in the third quarter, when his right leg was twisted in a pileup and he went down awkwardly. In considerable pain, he was helped off the field and carted to the locker room. The timing is terrible for Wilkerson, who was in the final year of his contract, which paid him $7 million in 2015. This season, he recorded a career-high 12 sacks (also a team high) and was named to his first Pro Bowl. The Jets tried to sign Wilkerson to a long-term contract before the season, but the two sides were far apart, and Wilkerson decided to put negotiations on hold during the regular season. The front office has said it would like to re-sign Wilkerson to a long-term contract. It's unclear how or if the injury will affect the Jets' plans. There's a good chance they will exercise the franchise tag, which is projected to be about $16 million. The Jets' talented defensive line faces great uncertainty as it heads into the offseason. Nose tackle Damon Harrisonwill be a free agent, and Sheldon Richardson is facing a possible league suspension stemming from an arrest in July. Richardson expects big changes in the offseason. "You just can't keep everybody on this defensive line," he said. "It's just not realistic. Guys are going to play out their contracts. I'm gonna miss 'em. ... We grew up together, pretty much, in the league. They helped me through a hard time in my life. It's going to be tough." 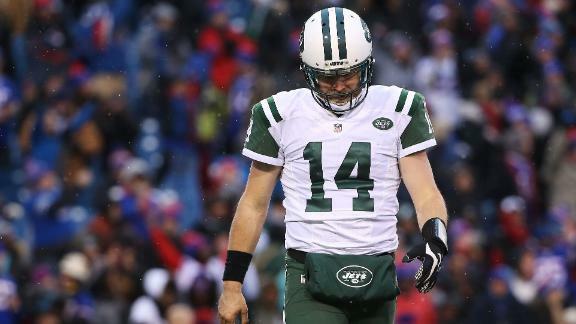 New York's Ryan Fitzpatrick throws three interceptions in the fourth quarter of a 22-17 loss to Buffalo.